Shoot some hoops and pull off a three-pointer! This gift basket is filled with "Go Team" Raspberry filled Shortbread Cookies, Chocolates, Cheese, Nuts, Spiced Gum Drops, Natural Hickory Smoked Sliced Summer Beef Sausage, Cheese Straws, Pretzel Twists (Salted Caramel, Smoky Barbecue or Cheese Pizza), Gourmet Popcorn (Almond Pecan Crunch, Cranberry Walnut Crunch, Dark Chocolate with Sea Salt Crunch, or Caramel & Cheddar Jalapeno), box of Focaccia Cracker Crisps, and a small Basketball to squeeze when it goes into overtime! 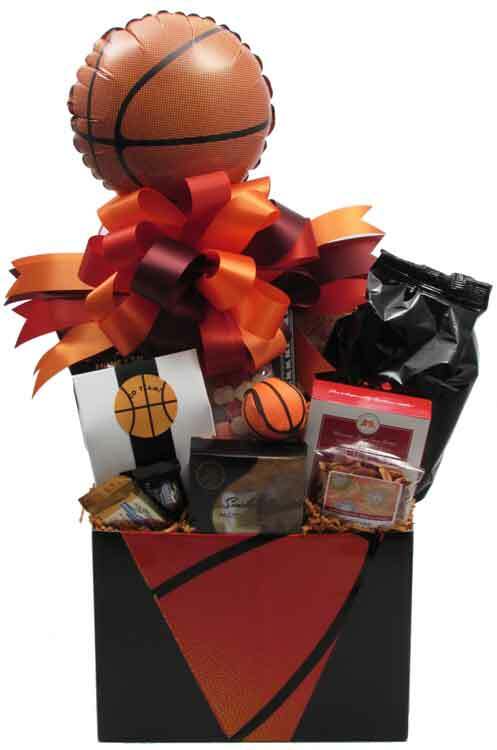 It includes a basketball banner and a handwritten greeting card Wrapped in crisp clear cellophane and topped off with a handmade bow. Photo is shown with a 9" air-filled basketball balloon that can be added to your order for $2 each. Note: In special instructions, indicate if you prefer a snack food assortment instead of a gourmet assortment. You can also include team colors.